At our town hall meeting on Tuesday, March 26, Michael Fossler gave us a clear and unbiased look at how reverse mortgages can be a smart and safe way to use home equity as a retirement asset. All in attendance found his presentation most informative. At that meeting, we welcomed Charles (Chuck) Cadwalader, branch manager of the Mission Gorge branch of the HomeStreet Bank, as the newest member of the AGGCC board of directors. order now Tuesday, May 28 – A representative of San Diego Gas & Electric will offer a detailed explanation of how the new schedule for pricing electricity works. We will provide you with all the information and technical expertise you need to decide on your plan. click here Tuesday, July 23 – The San Diego Humane Society, as the successor to San Diego County, took over animal control in the city. A representative of the society will discuss the services now available and how to obtain their attention in times of need. At our town hall meetings and during the operations of the Community Council, we offer programs and services that you will find to be of value, particularly on matters with which you have difficulty getting answers. Let us help you. Contact us with your suggestions and inquiries by way of email to the AGGCC president. As the AGGCC president, I am a de facto member of the working group that deals with the questions arising from the Superior Ready Mix mining at the quarry and its operation of the cement and asphalt plants. Our next meeting of the group will be on May 16. I will take your issues to this meeting. Please let me know by email of any observed or reported problems. I will present those matters to the working group and will report back to you and the community. I recently took a position on the board of the Navajo Community Planners, Inc. (NCPI) as a representative of Allied Gardens. I join our community in thanking Marilyn Reed for the many years of community service she provided in that capacity. She has been tireless in her advocacy of the interests of Allied Gardens as a member of NCPI and as a leader of our Community Council. I stepped into to the position on NCPI only because she was termed out of office (the rules require her to take a year off the board). It will be hard to match her successes, but I will give my very best effort to do the job as well as she did. The development of the stadium property by SDSU is on the edge of Allied Gardens and Grantville. But the traffic associated with the school, residences, business, and hotels will no longer be limited to “game day.” It will be our job to ensure that the plans include consideration of and measures to reduce that impact. The expansion of Montgomery Field operations includes a reduction of the flight path over Allied Gardens. NCPI has held one informational meeting on this matter and there will be more to come. Please plan to attend those meetings. 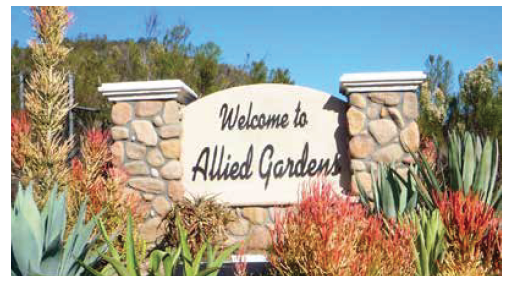 Allied Gardens has not received the attention we deserve for the use of developer impact funds. The expansion of residences in Grantville will have significant effect on Allied Gardens and we must receive a fair benefit from the resulting funds. Zephyr has just begun accepting residents. Our support of their journey away from homelessness continues. The AGGCC board of directors meets on the first Tuesday of each month at 6:30 p.m. at Benjamin Library. The next meeting will be on Tuesday, May 7. Join our board and we will support your passions for our community. — Shain Haug is president of the Allied Gardens Grantville Community Council. Reach him at aggccshain@yahoo.com or visit aggccouncil.org.